The benefits of blogging remain clear. From an SEO (search engine optimisation) perspective, a regular, well-written blog has become the cornerstone of online discoverability for SMEs and corporate giants alike. Blogs are an organisation’s primary means of connecting with new and existing audiences. They educate, entertain, deliver brand lift, and reward a website that’s well-stocked with written content with high-rankings on SERPs (search engine results pages). Brimming with keywords and links, blogs drip with SEO juice. When well-produced, they build trust, brand authority, and enable businesses to establish themselves as thought leaders within their niche. Vlogging – a contraction of “video blogging” – has steadily nosed its way into the mainstream as video has become an increasingly dominant online force in recent times. Indeed, research produced by multinational technology conglomerate Cisco reveals that video will account for a whopping 82% of all internet traffic by 2021 – up from 73% in 2016. Vlogs are increasingly accounting for more and more of this traffic. 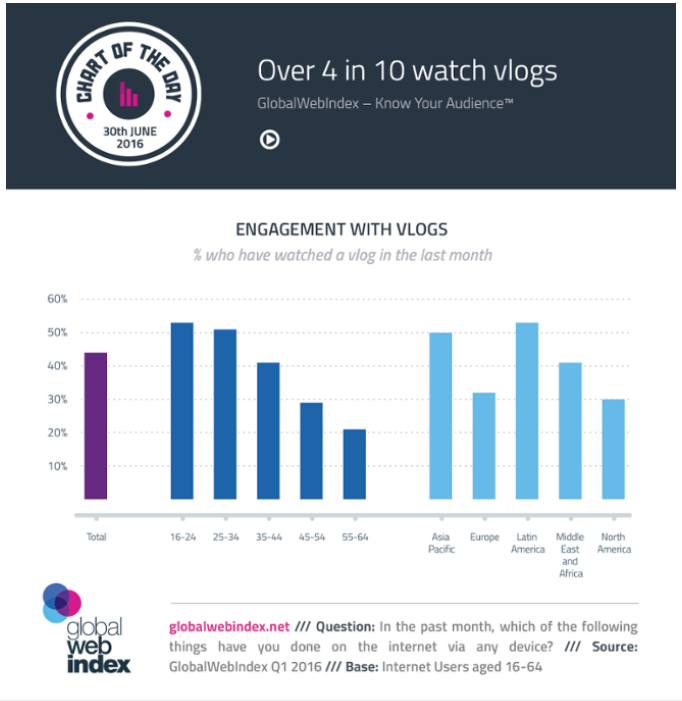 A study by GlobalWebIndex last year finds that 44% of global internet users now watching vlogs every month. We can see from the charts that vlog popularity skews towards the younger generations, and that the market regions of North America and Europe post slightly more modest figures than elsewhere in the world. But a reach of more than 30% in these regions is nothing to be sniffed at – particularly since vlogs are still relatively new on the digital scene. Clearly, vlogging is a rising and globally important trend that is here to stay. In essence, both vlogs and blogs have similar objectives – to educate consumers, inform, entertain, and (importantly) market the products and services of the business in question. As already discussed, blogs have the additional purpose of providing link- and keyword-rich content for a brand’s website, which aids search engine discoverability. But here’s an interesting piece of research from HubSpot – despite the fact that blogs are far more prevalent and brands are far more likely to make use of them, when it comes to what type of content internet users are the most engaged with, it’s video that comes out on top. In fact, while 55% of people will consume an online video in its entirety, only 29% will do the same with a blog. Blogging Vs. Vlogging: Which Is Right for Your Business? The growing importance of video is a trend that of course hasn’t gone unnoticed in the marketing sphere. Social Media Examiner, for instance, finds that 60% of all marketers (both B2C and B2B) used video as part of a content marketing strategy in 2016, with 73% planning to increase their use of video this year. But there are lots of formats that video can take, and of course these statistics encompass video marketing in its entirety – not just vlogging. So, in what circumstances is it right to launch a vlogging strategy, and when is it best to stick to blogging? In 2017 and for the foreseeable future, blogging should always be part of any content marketing strategy – regardless of whether it is backed up by vlogs, or not. This is because – above all else – blogs are ideal for loading up your site with targeted keywords that will help new customers find you online. True, it’s possible to keyword-optimise your vlog (and other video) content in video descriptions, but the opportunities are fairly limited when compared to the good old-fashioned blog. Until the day comes that search engines are able to recognise every word spoken in a piece of video content (like they can with written content), blogging will always be an essential piece of the discovery puzzle for users searching for a business like yours online. Blogs also allow for more traditional link-building initiatives – another crucial SEO factor. A well-researched blog that’s backed up with solid online promotion is apt to garner a lot of attention, a lot of shares, and a lot of backlinks from other bloggers and commentators referencing the article. And when it comes to building SEO, it’s also important to load up your site with plenty of outbound links to other well-researched articles – and blogs provide the perfect medium for doing so. Aside from the technicalities of search, blog content is also crucial for building your brand’s authority and reputation for expertise. Educating visitors through the written word can have a lot more power when compared to vlogging, which, despite its growing popularity, is often still perceived to hold more entertainment than educative value by some. And indeed, when all’s said and done, blogging is a tried and trusted lead generator – B2B marketers that blog generate 67% more leads per month than those who do not; B2C companies generate 88% more leads. 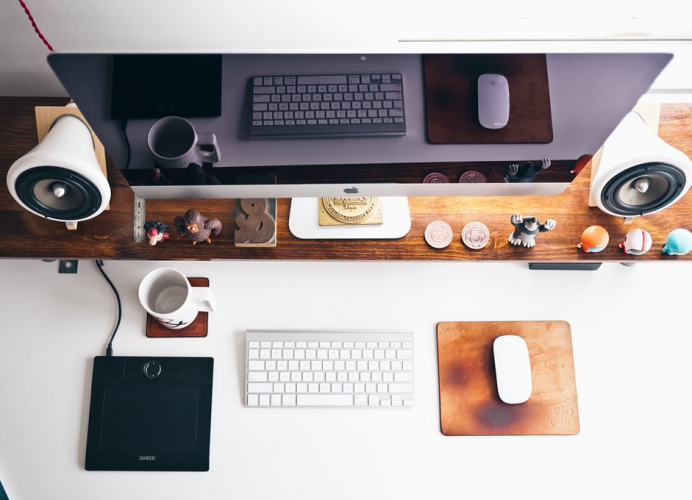 All companies should be blogging regularly. Vlogging, by contrast, is slightly more niche, and won’t be suited to every brand or business. As we can see from the GlobalWebIndex study above, the vlog is favoured by younger audiences. This makes it an ideal medium for many B2C companies – particularly those where video demonstrations showing how to use the products on sale can be easily produced. Many make-up and fashion brands, for instance, make great use of vlogging. What’s interesting, however, is that many of these brands enlist influencers – often customers – who have built up a strong vlogging audience themselves, and reward them in various ways for continuing to produce vlogs and staying loyal. A recent report from Fashionbi found that the top-of-the-list beauty vloggers have an average online audience of 26 million – so it’s no wonder that the vlog is hailed in the cosmetic industry as the strongest marketing tactic available today. Vlogs, indeed, have the potential to ‘go viral’ in a way that blogs simply don’t. But, it must be said that the vlog isn’t limited exclusively to the realms of B2C. Today, video is becoming more and more important in the B2B realm, too, with business leaders increasingly turning to video content to make business decisions. In this regard, there’s nothing stopping B2B companies experimenting with turning some of their blog content into vlogs and seeing if increased engagement can be engendered. And of course, ‘How-to’ vlog content is not the reserve of the beauty industry either – software companies (both in B2B and B2C), for instance, can make use of vlogs to show how their solutions work, how easy they are to implement, what the efficiency-savings are, etc. Vlogs, indeed, can be the solution for turning some relatively ‘boring’ topic into something much more engaging and exciting. And with the growing importance of video marketing right across the board, there’s a growing case for more and more businesses to start introducing the vlog into their ongoing content marketing strategies. If you need help with your blogging, vlogging, or any other part of your content marketing strategy, then please don’t hesitate to get in touch with us here at Cope Sales and Marketing – www.cope-salesandmarketing.com. Looking forward to hearing from you! !